Want to give your look a splash of color and a big dose of class? 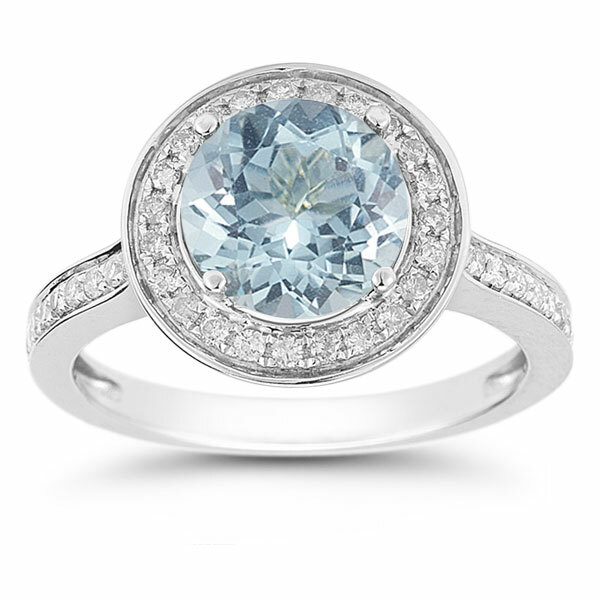 This Aquamarine and Diamond Halo Ring in 14K White Gold could be a perfect pick. With a sparkle that brings to mind the sunlight on a gentle ocean wave and a time-honored style, this is a chic and colorful pick. Glimmering from the center of this simply sophisticated style is an 8mm round aquamarine, a gem with a refreshing light blue hue that captures the essence of the clearest Caribbean waters, and a glitter that resembles a ray of light dancing on the surface of the sea. This fresh-looking gem is surrounded by a round frame of small channel-set diamonds that gently reflect the color of the center aquamarine. Additional channel-set diamonds adorn the band of this glamorous style, for a total of 43 diamonds (0.43 carats) in all. The halo style of this ring dates back to the 1920s, a time when glamorous geometric designs were in vogue. This design experienced a resurgence in the 1960s, and is once again peaking in popularity for its simple yet upscale appeal. However, with its big dose of timeless sophistication, this colorful halo ring is one piece that will never fall out of fashion. 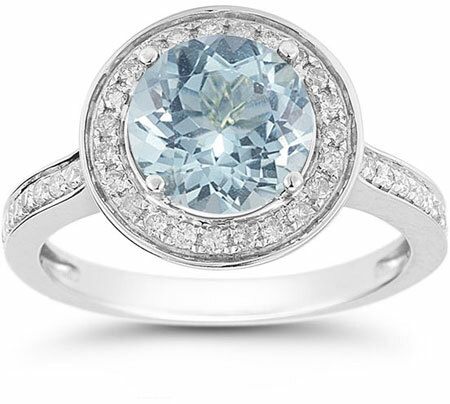 We guarantee our Aquamarine and Diamond Halo Ring in 14K White Gold to be high quality, authentic jewelry, as described above.